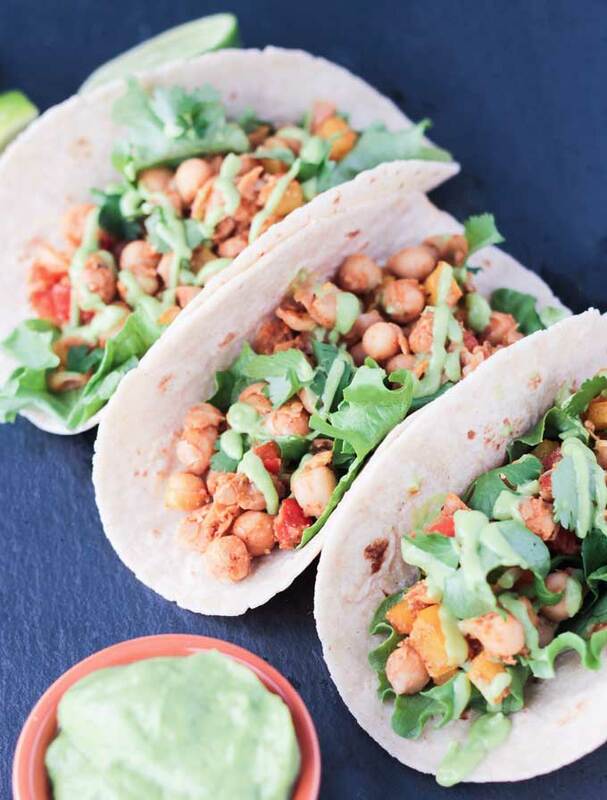 These easy Bell Pepper & Chickpea Tacos w/ Avocado Green Chile Sauce can be made in just 15 minutes. Using ingredients you likely already have in your pantry and just a few fresh items, you can be enjoying Taco Tuesday in no time! 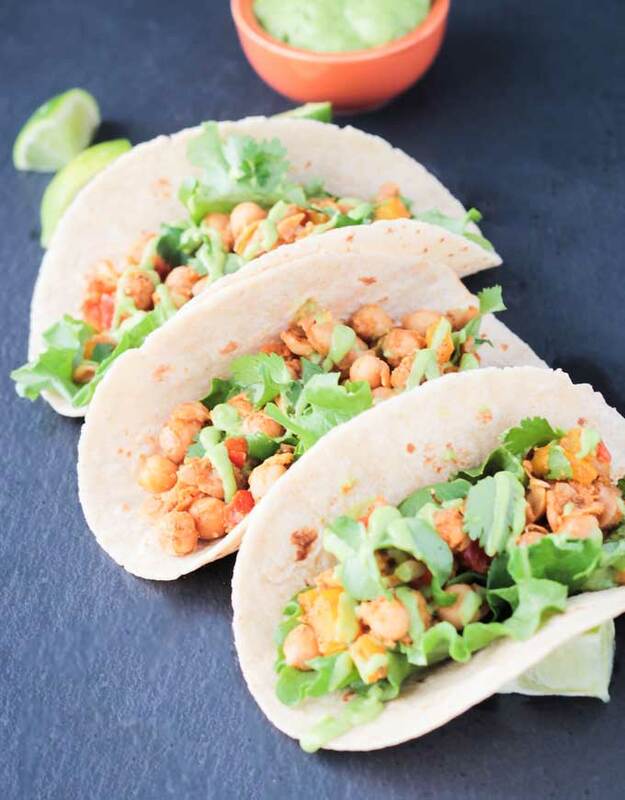 The best part about these chickpea tacos is that they are so quick and easy. Perfect for any night of the week. We all have those nights where that last thing we want to do is make dinner. We either don’t have time or we don’t have the energy. But, we also know that take-out or frozen pizza is not the best way to go. 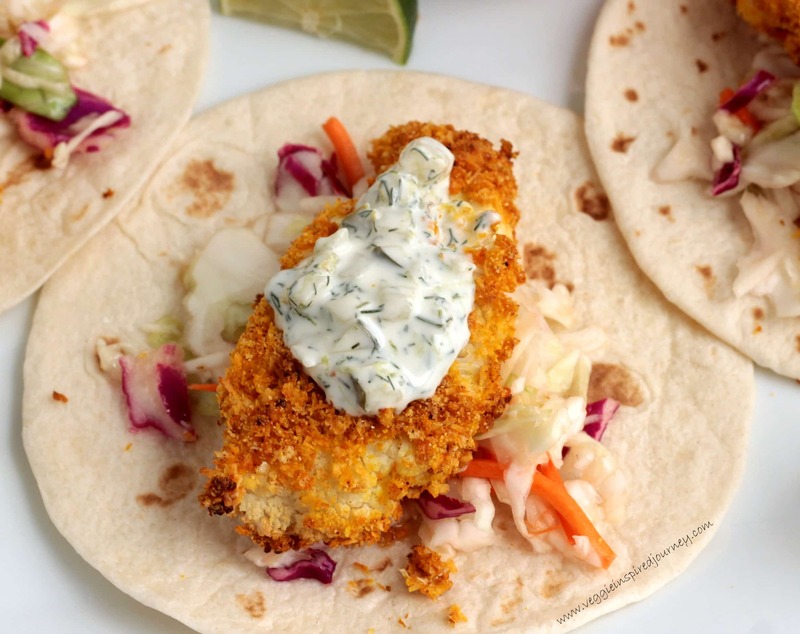 These budget friendly tacos are just the answer. Just 15 minutes from start to finish! Which also makes them a perfect choice for a super fast lunch as well. The sauce could not be easier. Throw it all in a blender and puree. Add a little water to thin it out if necessary. 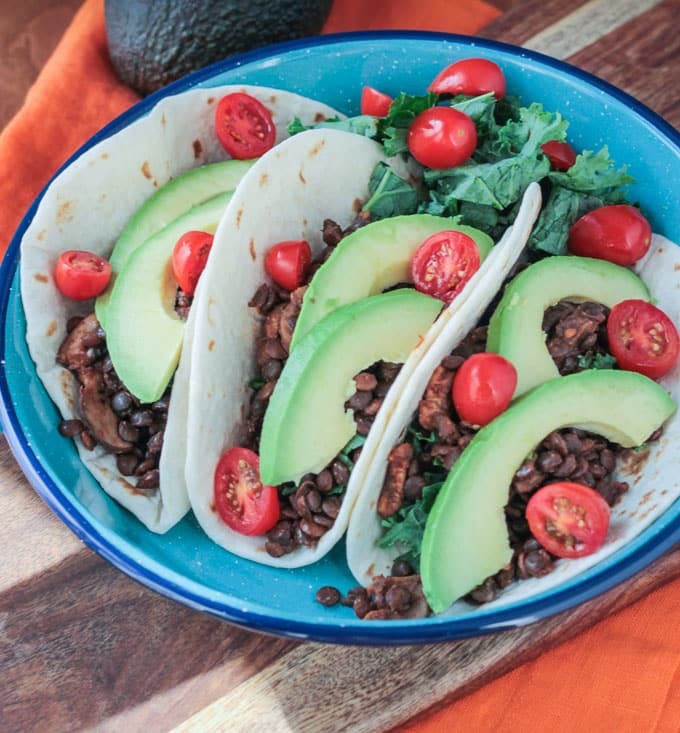 Now, go make these yummy vegan tacos and revel in the fact that dinner is done! As always, I love hearing from you, so leave me a comment and let me know how you liked them. Thanks, guys! Heat 2 tbsp vegetable broth in a skillet over medium heat. Add the garlic, chili powder, cumin, smoked paprika and oregano and cook through about 1-2 minutes. Add the chickpeas and peppers and sauté 2-3 minutes, stirring occasionally. Add the remaining 2 tbsp of vegetable broth and saute another 4-5 minutes to heat through. Add salt/pepper to taste and adjust spices as necessary. Nutrition facts calculated for tacos and sauce together. These look amazing, Jenn! I absolutely LOVE chickpeas! 🙂 Perfect for our next taco night! I love tacos, I love chickpeas and of course I love sauce. Looks delish Jenn! Thanks, Sophia! Tacos are never wrong! The avocado green chilli sauce is calling to me, like guacamole but not quite. Yum. Hmmm, I never thought about it like that. I bet it would be great with chips! Just had a convo with my vegetarian friend about the lack of veggie centric tacos near us. This is the perfect substitute for meat and fish! That’s interesting, Michelle. I always find Mexican to generally be a really safe choice if we are eating out. I can almost always find something to eat there. Though, there isn’t much variety…it’s all rice and beans and sometimes peppers/zucchini. I would like to see some more creative veggie tacos in restaurants! Oh, thank you so much, Jac! Love the avocado green chilli sauce. It all looks delicious. My only problem, not being familiar with tacos, is wondering how to eat them. I’m familiar with wrapping like a burrito, but these I’m a bit unsure about. You would eat it like any soft taco. A little bit of the filling fell out when we were eating them, but that generally happens with any taco, right?! Thanks, Choclette! Looks so delicious. Ingredients are cool and love the color of it. My favorite part would probably be the Avocado dressing! I’ve done similar dressings with jalapenos instead of chiles or sour cream for an even creamier texture but the chiles version will have to be a new one to try on our Taco Tuesday. Jalapeños would be a great addition to add some heat! I love the flavours you have going on in those tacos and that sauce sounds right up my street. I love chiles! Love how simple these are, but also so full of flavour! Tacos are always a good idea!! Thanks, Leah! Totally quick and easy. Taco Wednesday is totally acceptable! I really love chickpeas, too. I buy them every time I’m at the store even if I already have plenty at home. I never want to run out!! 🙂 Thanks, Linda! im a big fan of chickpeas but never used it in tacos. love this idea. Oh, you definitely should, Dixya! I think you would love them! Thank you! 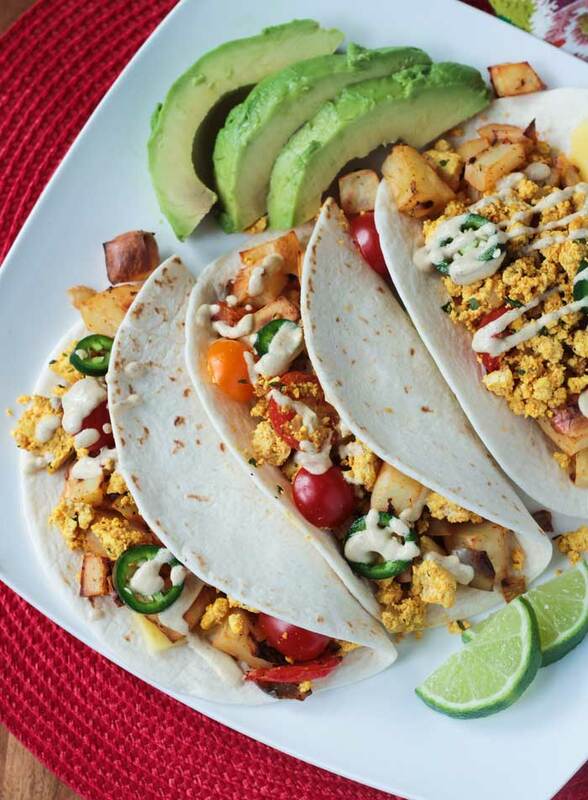 These tacos look so healthy! Thanks for the recipe!! 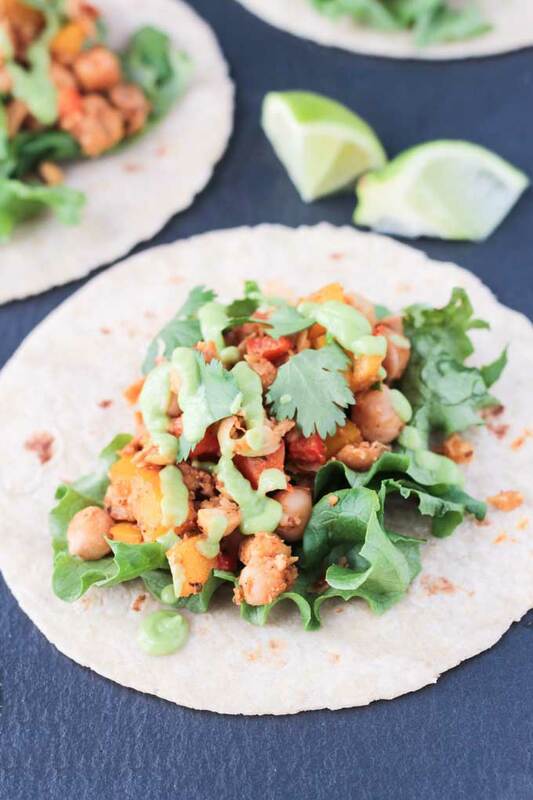 Chickpeas are so versatile, and the fact that they can be used as a taco ingredient is great! A really nice veggie taco you’ve made! Thanks, Whitney! Definitely versatile – I use them all the time. I love meals that just happen based on what’s on hand! 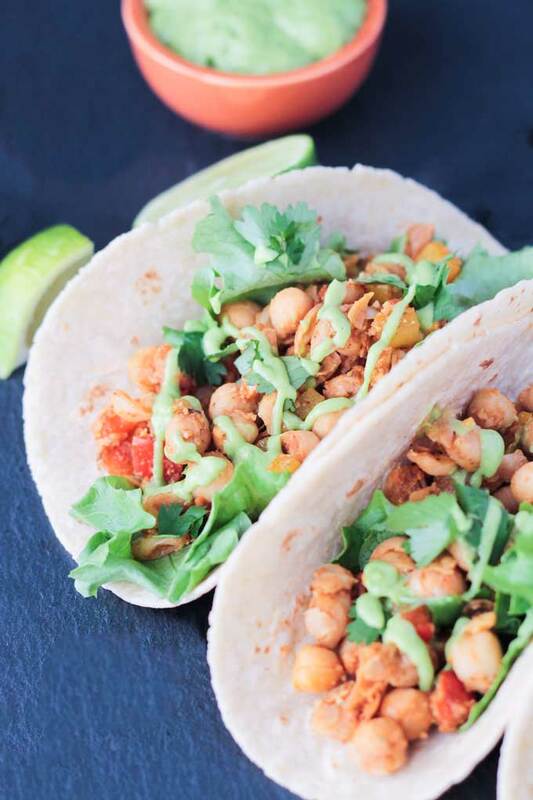 Such a great idea, chickpeas are the best instant taco filling, and that sauce sounds spicy but super flavorful. Easy peasy, taco night done! Thanks, Natalie! I love that chickpeas retain a bit of a “bite”. Not exactly crunchy (unless you roast them) but a great texture paired with the soft tortillas and crisp peppers. Who doesn’t love Taco Tuesday?! Well happy taco tuesday…in a snap!!!! Tacos are a great quick option to through together! Just got to warm up some beany filling and stuff a shell 😉 Yum and satifying! So easy, right?! Happy Taco Tuesday!! 🙂 Thanks, Rebecca!